For the most part, pitchers don't get a lot of love in the hobby. And when it comes to relievers, it's even worse. But at least one exception has emerged. As he enters the Hall of Fame as the first unanimous selection, Mariano Rivera cards, most notably Mariano Rivera rookie cards, are finally recognized among the hobby's elite. The are several factors that make him an exception. The first is his dominance as a closer, a roster spot that is known for guys that have a couple of strong seasons before dropping off the map. Rivera is the all-time saves leader for a reason. He's managed to hold his spot for nearly two decades. That's dominance. Rivera also spent his entire career with one team, a rarity in modern sports. Not only is it one team, but that team is the New York Yankees, the most storied franchise in baseball history, especially as far as Yankees baseball cards. 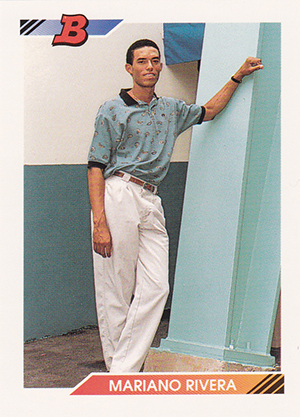 View the most popular Mariano Rivera card auctions on eBay. A throwback to times when autographs were not only legible but a work of art, Mariano Rivera's signature is a thing of beauty. Each letter is formed carefully with a neat flow. But good luck finding one in a pack. Although there are several hundred different signed Mariano Rivera cards, most are in extremely short supply. 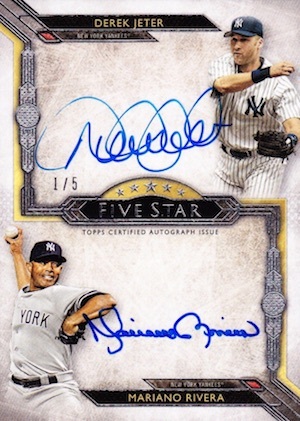 And the number of actual sets that have Mariano Rivera autographs is extremely small. It is likely there will be multiple options in 2019 sets, as well. If you're looking for Mariano Rivera autographed memorabilia, he has a deal with Steiner. While it's somewhat subjective, we've compiled a list featuring some of the best Mariano Rivera cards. We tried to limit it to cards that are somewhat available, so there aren't any one-of-ones. Value isn't the only factor either, although it plays a significant role. 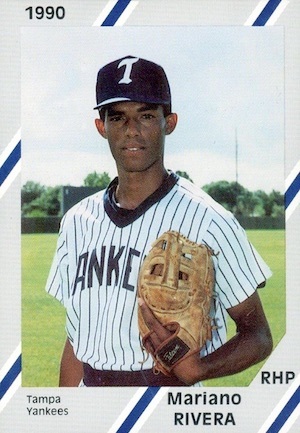 Check out more information regarding his earliest minor league and rookie cards in our detailed Mariano Rivera card guide. 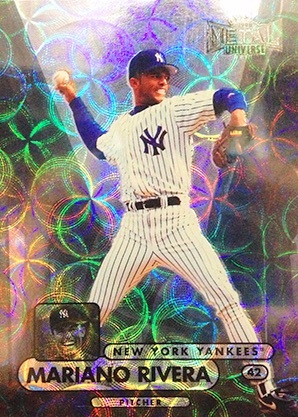 The 1990 Diamond Cards Mariano Rivera may not be the flashiest card, but it is significant for being the first of the Yankees legend. Predating his official rookie card by two years, it's relatively tough to find but not impossible. Mariano Rivera is something of a modern hobby anomaly. He has just one rookie card. It comes from 1992 Bowman Baseball, a set that's notable for its deep rookie checklist. Another thing the set is known for is the casual (and decidedly dated) attire many of these youngsters are wearing. Rivera looks like he's ready to hit the golf course and not the pitching mound. 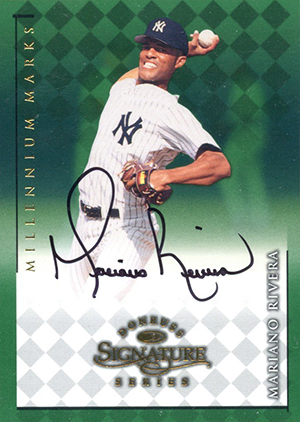 If you're looking for an autographed Mariano Rivera card, 1996 Leaf Signature Series is the most popular. Not only is it his first autograph card, but it's also one of the most attractive. It comes with three different versions that are discernible by the foil medallion on the front of the card. Bronze is the most common, followed by Silver, then Gold. 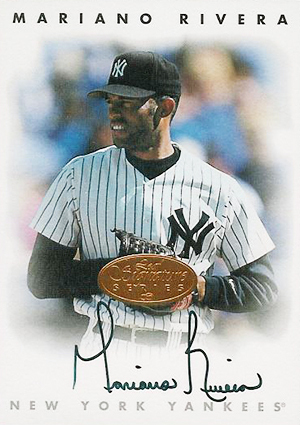 All rank among the most valuable Mariano Rivera cards with the Gold version understandably commanding the most. If the 1996 Leaf Signature Series Mariano Rivera is too expensive, 1998 Donruss Signature Series represents a slightly more affordable choice. The base version, which has a red background, is reportedly limited to 900 copies. Capped at 1,000 cards, the green Millennium Marks edition is actually more common. The rarest version of the card is the blue Century Marks parallel with just 100 copies. Precious Metal Gems don't carry quite the same history and swagger in baseball as they do in basketball. But that doesn't mean they're not valuable. As player collectors look to fill in gaps, many of these wild and rare parallels are seeing strong numbers. 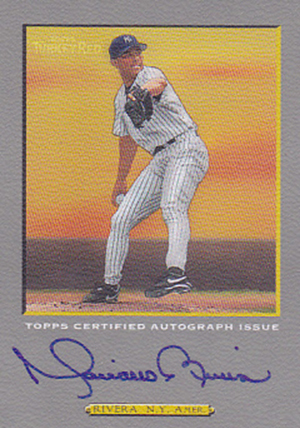 The 1998 Metal Universe PMG Mariano Rivera doesn't show up very often now as most have made their way into personal collections. There are also other parallels from this era that offer similar loud designs and rarity. 1997 Pinnacle Totally Certified Platinum Gold is a card that nearly made the cut but given its age and print run of 30, it seemed a little too obscure. 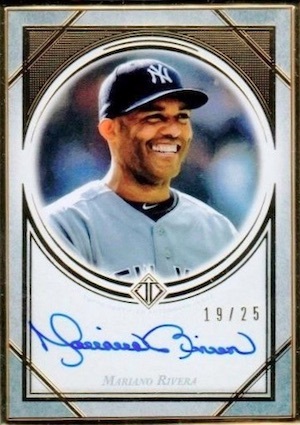 Just as Mariano Rivera doesn't have a lot of autograph cards from earlier in his career, options for autographed memorabilia cards—at least ones that are available with reasonable quantities—are even tougher. And while a card with a print run of 50 is hardly common, the 2004 E-X Clear Authentics Signature Mariano Rivera is one of the first that you might be able to find. Most of the other autographed memorabilia cards released around the same time frame are numbered to 10 or less. 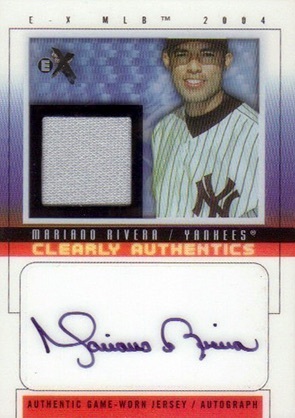 However, recent sets have increased the overall supply of Rivera's autographed relic cards. 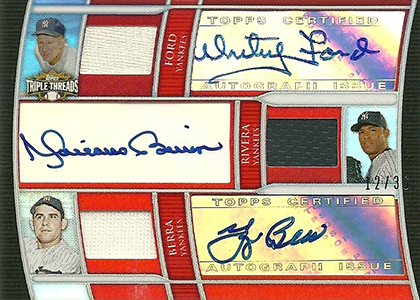 Inserted in packs as a redemption, the 2005 Topps Turkey Red Mariano Rivera autograph has a stated print run of 192. It carries the distinct Turkey Red look and texture as well as a nice spot for an on-card signature. The main card is rarely seen and it has four parallels, all of which are extremely rare. The Red version has 15 copies, Black has five, two for Gold and the Suede parallel is a one-of-one edition. 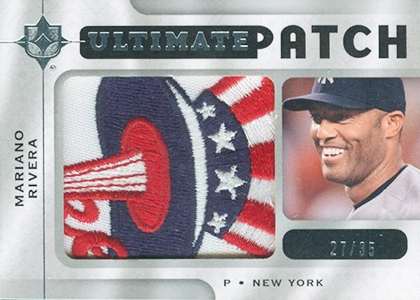 2009 Upper Deck Ultimate Collection Ultimate Patch cards are still some of the most attractive memorabilia cards. They balance a massive swatch area with enough room for a decent-sized player photo. Numbered to 35, the patches themselves are also amazing but the cards almost never surface. Mariano has other patch cards over the years to track down, as well. For many, this card won't win many awards for design. But it does stand out by including autographs (albeit stickers) and memorabilia swatches from three Yankees legends. The pairing may be a little curious, but it's doubtful many would complain if one popped out of their box. The base version is limited to 36 copies, although there are a bunch of different parallels. There have been other impressive multi-player editions featuring Rivera, including a combo with Jeter in 2018 Topps Five Star. This card is interesting on a few different levels. The first, and most important (at least from an aesthetic perspective) is the silver signature. 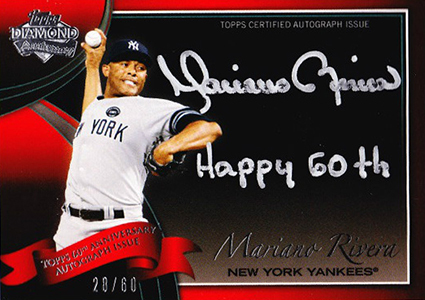 It's also got a short inscription wishing Topps a "Happy 60th" that shows that Rivera's printing is as neat as his handwriting. Numbered to 60, it's part of a set that was released across several Topps sets in 2011 as it celebrated its 60th year of making baseball cards. Okay, that's 10 cards, but you honestly can't go wrong with any of the premium Mariano Rivera autograph cards. While it used to be that there were just a few "high-end sets," the fundamental change to the hobby has resulted in a surplus of quality choices. 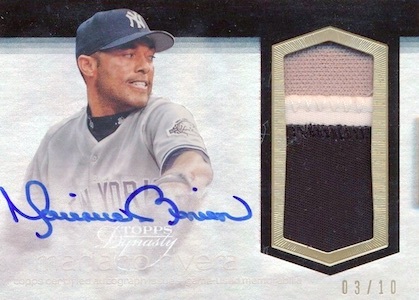 The supply is still low and the individual cards are still rare, but the overall amount gives collectors a better shot at Mariano Rivera autographs like the autograph relic in 2018 Topps Dynasty. Are there any other Mariano Rivera cards that top your list? Let us know in the comments.